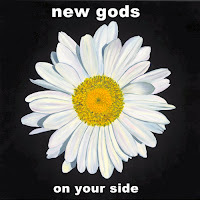 For those saddened by the break up of Little Red fear not as the band's spirit lives on in New Gods. The band features Dominic Byrne on lead vocals and Adrian Beltrame on guitar both former members of Little Red. 'On Your Side' is New Gods' first single off their upcoming EP and for a newly formed band it has a surprisingly accomplished sound; rolling drum beats, classic harmonies and anthemic, slow-building orchestration.